Today, Walton-on-the-Naze pier, the 3rd longest in the UK, is a must for all the family, providing hours of fun with amusements, rides, childrens soft play area, ten pin bowling alley, restaurant and bar. 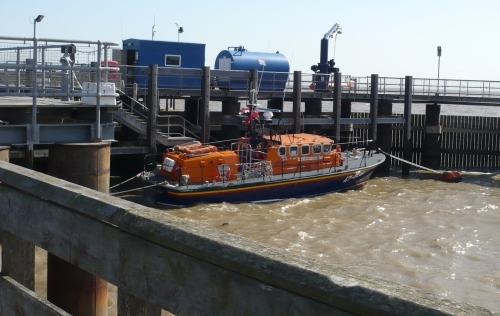 The pier also provides a great days fishing and hosts Walton and Frinton’s lifeboat. The first 150ft pier at Walton-on-the-Naze was built in 1830 opposite ‘The Hotel’ which was later to be called Kents Hotel and Dorlings Marine Hotel, which is now the site of The Dorlings. The pier was lengthened to 330ft in 1848, and was one of the earliest piers built in the UK. Its purpose was for the landing of passengers and goods for Walton. Paddle steamers would operate between London and Great Yarmouth/ Ipswich, and Walton became a very popular destination for holidaymakers, using the once-per-day Belle Steamer service. In 1880, a severe storm washed the first pier out to sea. In 1869, a second pier measuring 530ft, was built by Peter Schuyler Bruff, at the location of today’s pier. It still only allowed steamers to berth at high tide. In 1897, it was sold to The Walton Pier & Hotel Company. This company went bankrupt and the new owners, The Coast Development Company extended it to 2610ft being completed and opened in August of 1898. This new length allowed steamers to berth at any state of the tide, thus bringing a much more efficient service to the town. At this time, Walton Pier was the second longest pier in the country, after Southend. The title has since been taken by Southport Pier, Merseyside. Walton pier today is now the third longest in the UK. Walton has been influenced by the hands of the sea for hundreds of years. The old church fell into the sea in 1798. In more recent times, in 1978-79, storms battered the East coast and severely damaged the wooden structure of the pier, eventually causing a 108ft section to fall into the sea. The pier was never intended to be an entertainment centre. It was bought in 1937 by Charles Goss, who formed the New Walton Pier Company. At the time, the pier was home to a pavilion at the seaward end, plus an amusement arcade and the ‘Seaspray Lounge. There was also a tent that served as a theatre. Since the purchase, and especially since 1946, there was a steady expansion of the amusement facilities. Today there are around 5 acres of amusements, including a ten-pin bowling alley, and a childrens soft play area making it one of the largest undercover funfairs in East Anglia. The original piers had no transport – passengers would walk to the end. Once it was lengthened in 1898, it operated a 3ft 6in gauge electric tramway. In 1935/6 it was replaced by a pneumatic-tyred battery car, running between two wooden beams. Part of the pier, the pavilion and battery car were destroyed by fire in 1942. After the war, contractors repairing the pier laid a 2ft gauge railway track for a diesel locomotive to transport materials to the end of the pier. This was retained and used for pleasure rides. The railway ceased operating in the 1970s. Currently a “Dotto train” operates at peak times. The Walton and Frinton lifeboat has been moored at the pier since 1900. The first Walton RNLI lifeboat was the “Honourable Artillery Company” but the first lifeboat to be moored at the end of the pier was the “James Stevens No.14”. On 1st May 2005, a new berth with wave break was opened with added maintenance and storage facilities, at a cost of around one million pounds. The current lifeboat, the “Kenneth Thelwall II” was put into service in 1990. Walton Pier allows keen anglers to cast their lines out to sea for a mere £5 per day (9am – 5pm) or if you are die hard fisherman then an annual licence can be purchased for £60 which gives 24hr a day access to the pier. A live webcam stream can used to be supplied by Frinton and Walton lifeboats but has been offline in recent months. Many thanks to Marie and Gerald Hornsby for providing the article and associated images. Hi there walton on naze is a really cheap days out for the family.the rides are for everyone they have baby rides and teenage rides and adult rides.the rides cost a book of tickets 60 or 80 for £20.00 or less and you can also buy single tickets for £1.00 each.it is a cheap day out if you have a large family.walton pier also have a bowling area and people can go fishing at walton or walk along the pier;but there is nothing at the end of the pier;just a lovely walk and fresh air.also walton pier has baby changing facilties and toilets inside the pier.and walton has a fish resturant there which is quite tasty.plus you can get tea and cofee from the side kiosk on pier.plus you can enjoy the machines as well.hope this is some interest for you best regards christine. I was working on the pier at the time and Mr M Goss treared me and entered me in the competition. Unknown to himand me at the time some 300 to 400 anglers took part,. I was just a nouice angler, but surprise surprice i won my picture on the putmans web page shows me with fish etc.I won heaviest catch and heaviest fish, i won two rods and a reel plus £35 00 in cash which was two weeks wages in those days. Hench as Mr M Goss treated me i treated him and brought back the cod next day filleted and ready to cook. I wonder if someone can help me find an old friend who used to work on the pier. His name is Colin Rouch and I used to write to him over a great number of years. I last knew that he was living in North Street in Walton and was still working on the pier. I know that he was 16 years older than me, so he will be turning 56 this year (2010). If anyone has any information about this wonderful man, I would be so grateful. Fingers crossed, Nicola O’Brian (Nicola Kenny back then). It aint that happy harry fella that works in the cafe is it? That guy has a smile for nobody.